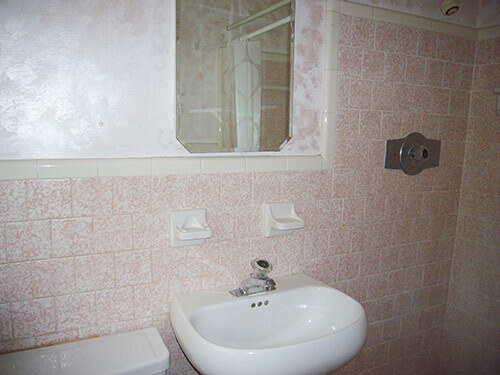 Can we find a low-flow, centerset faucet with retro style for Amber’s time capsule pink bathrooms? Amber has been longing for her own little piece of retro real estate for years and now she and her husband have finally found it — a 1960 house complete with two original pink bathrooms. Amber doesn’t want to change much (she’s taking our tips to Go Slow with any major renovations), but because she lives in an area that has water usage restrictions, she must replace both of the bathroom faucets with low-flow faucets before the city will turn on her water. The sinks in both bathrooms have single-hole centerset faucets — and Amber wants our help to find replacements for that fit the style of her vintage bathrooms. 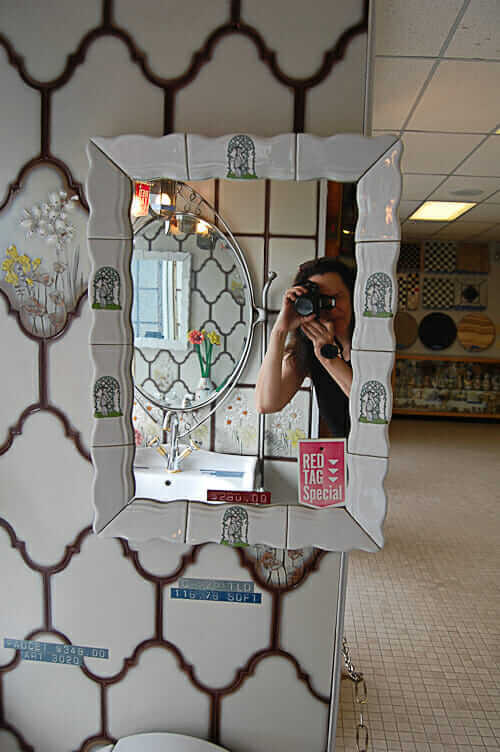 I’ve written you before, always lusting after the beautiful original bathrooms people post on Retro Renovation. Well, guess what? My husband and I are buying a new house, and it is everything we have dreamed of — a one-owner home built in 1960 with almost everything original and in great shape. And it has TWO pink bathrooms! However, where i live, we have an ordinance mandating that all houses built before 1993 be upgraded to “low flow” fixtures before the water can be turned on. The shower heads and kitchen faucet are fine (they were upgraded at some point) but I have to replace the toilets and bathroom faucets. 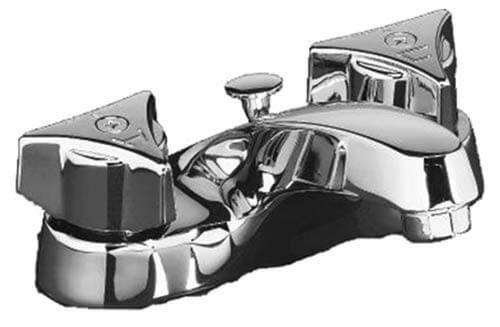 I am not so upset about replacing the faucets because personally I don’t like the style of the existing ones (and I’m not even sure they are original – they look more 1970s/80s to me). I am sad about having to replace the pink toilet – but c’est la vie. Thanks to your site, I found the Kohler Wellworth and I think that’s what we’ll choose. I’m interested in advice on what to use for the faucets, though. I saw the posts about Strom Plumbing and Elements of Design, but I think I will need to have an “all in one” instead of separate faucet and handles, since that’s what is there now. Pictures are attached. Would love any advice you or your readers can offer! 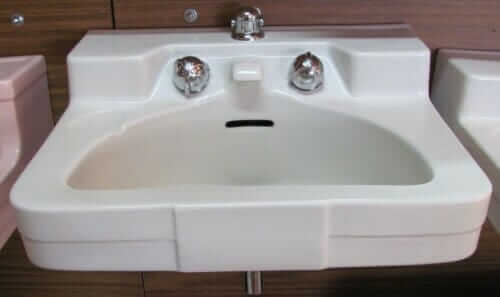 Meanwhile, we totally agree with Amber that the sinks in both bathrooms do not appear to be original. Nor is that vanity in bathroom #2. Very 1980s, we agree. Amber, if you think that down the line you may Retro Renovate the sinks — take them back to original style — we recommend that today, you spend the least amount of money you need to on the replacement faucets. For this — we recommend that your first purchase be a subscription to Consumer Reports, which does the best job that we know of in researching and then calculating cost/value of house fixtures. Heck — Pam says that when she was doing her bathroom and kitchen renovations, she researched pretty much all her purchases using Consumer Reports. She did not make *every* decision based on their recommendations, but she did depend on their research as another great input. Another thought: If Amber thinks she may replace her sinks in the future — with one that may take a different configuration of faucet — a quick and easy fix for now might be to get an inexpensive screw on faucet aerator — like this Neoperl Faucet Aerator from Amazon.com. She will need to check with her county regulations to see if this will be an acceptable fix and will allow Amber’s water to be turned on — but this solution could be the most inexpensive and allow her to live in the bathrooms a while before deciding if she would like to keep or change her current bathroom sinks. Many of the low-flow faucets are marked with the EPA’s Water Sense logo to show that they meet the EPA’s guidelines for water saving faucets. All of the above faucet choices were marked with the Water Sense stamp of approval except the Grohe models above — however they do have maximum flow rate of 1.5 GPM — which meets the requirements for a low flow faucet. Bottom line — double check to make sure that any faucet you choose meets the flow requirements for the county you live. 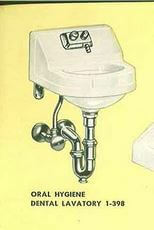 Readers — what are your suggestions for faucets that would be appropriate for Amber’s two vintage bathrooms? Thanks for posting this, Pam, and thanks for the comments, everyone! I have responded to some of the comments individually. We are so excited about our two pink bathrooms. Although the white pedestal sink in the master bath does not look original, I don’t mind it, and I’m not in a hurry to replace it. I do think the vanity and cabinet in the hall bath are original. You can’t see the vanity very well in the picture here, but it is Formica (or some similar material) with metal edging. The sink may be 80s but I am not positive, and again, I don’t really mind it, so while I may replace it one day, it’s not on my list of things to do right after we move in. If anyone has any ideas about paint color for the walls, I’ve love to hear them! The sponge paint job just isn’t doing it for me. 😉 But I am not very good at imagining what colors will work well together! Thinking light gray for master bath since it is tiny, no clue for hall bath! In our house we have a half bath that has speckled pink tile somewhat similar to yours. I went back and forth over what color to use. My grandmother (in 1982) put an orange color on the wall. It was very 70s mod. Ultimately I repainted the ceiling flat white (which will usually make the room seem larger and a bit more modern without losing the mid-century feel) and choose a very slightly yellow toned paint for the wall – Behr color “Camembert”, color number W-D-210 at Home Depot. It’s just enough yellow to provide contrast to the ceiling but it won’t run over the pink color in the tiles. In that pink bathroom, since you have to replace the toilet anyways – given the pink there, it might be a nice contrast to replace the cultured vanity with a white pedestal sink or wall hanging sink that is mid-century compatible. Or that pink Crane version you had potentially mated with a pink toilet could do the trick. 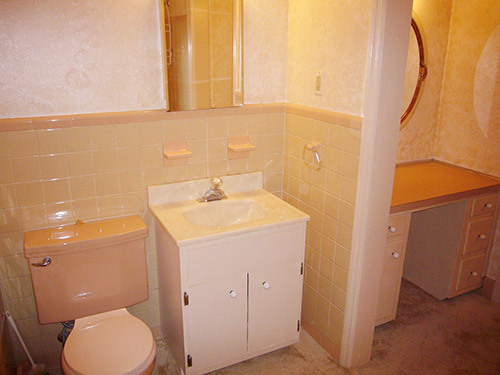 You may want to invest in an inexpensive toilet just to get your water turned on and buy yourself the time to see if you can find a way to match your pink Crane sink. Just thinking out loud. Side note – I’d be willing to bet your shower faucet has also been replaced too. That wide metal plate is often a cover plate when they retrofit the three-handle bathroom fixture that was common from the 50s to the 70s into a single-handle faucet. Well, I can tell you what *I* would do regarding the original pink commode. I’d get an inexpensive low flow toilet, have it installed for the inspection, and store the pink one out of sight. Once the water was on I’d put the pink one back and save the new one until I sold the house, then re-install it and offer the new owner the old one. If they didn’t want then it I’d take it with me. If you don’t know how to replace a toilet, there’s no time like the present to learn! 🙂 It’s really not as difficult as one might imagine if they’ve never tinkered with one before. I can understand rules about low flow fixtures for new construction or major renovations where the drain could be sized properly, but as Doug pointed out it could cause trouble down the road (or down the pipe, as the case may be) just simply replacing the fixture. Hadn’t even thought of that. That’s a great idea. This is great timing. The pop up drain in my master bath (the tiny bathroom…things were a lot different in 1960) came loose a month or so ago. I haven’t worried about it because I wanted to change the faucet anyway. I’ve actually been dreading trying to track down the perfect faucet and haven’t even looked further than the occasional gander down the bath isle at HD. Well, I need not look. Low and behold, Kate and Pam, you’ve done the work for me! I’m head over heels for the AS Ceramix! I’ve even found it with the drain and excutcheon plate for under $150. I’ll be ordering one later this week and if all goes well, I’ll get another one for the second bathroom. Thanks for all of the hard work! Amber, please keep us posted on what solution you chose. Now that we know the low-flush pink toilets are available from Gerber and Peerless, it’s too bad it’s so far past your move-in date. You’ve probably replaced the toilet already, the water is on, and you are in your new house. Reading your posts, I really like your attitude about the whole thing. I like that you have figured out what you can live with for the time being and that you are following Pam and Kate’s advice to go slow. I don’t know if this is your first house or not. My “new” house is my third home and my second vintage house. And I had to learn on the first house not to jump in and spend all my budget on the cosmetics. Then within the first two years in that house the water heater and dishwasher broke, the shower leaked, the stove needed new burners, you name it. And by then the seventies had turned into the eighties, and I was tired of the color combinations I’d chosen for the whole house and wished I could afford new paint and curtain fabric. But as the Amish say, “Ve are too soon old and too late schmart.” 🙂 Have a relaxing and enjoyable time settling into your new home. For the faucets, I went with the American Standard Colony. Very sleek and simple. I actually *did* get the Gerber pink toilet… it was a bit of a saga! We just finished moving this weekend but whenever I have some downtime I am going to write a post all about it. The Gerber pink toilet looks great and it even has a cool retro-looking flush handle! Amber, that is a nice line of faucets. Can’t wait to see your pictures and hear the saga of the pink toilet. You just moved into a mid-century house that needs a little work, and you’re expecting down time? 🙂 Just kidding–I know you will pace yourselves.